U.S. 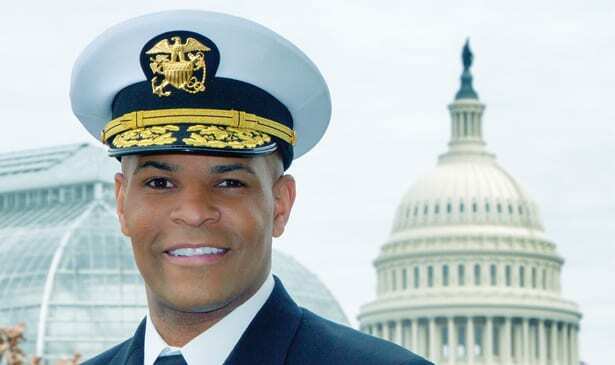 Surgeon General Vice Admiral Jerome M. Adams, M.D. NASHVILLE, TN — Jerome M. Adams, M.D., M.P.H., the 20th surgeon general of the United States, will be the featured speaker at the 143rd Commencement Exercises for Meharry Medical College, Saturday, May 19, 2018 at 9 a.m. at the Grand Ole Opry House Auditorium. Dr. Adams was sworn into office by Vice President Mike Pence on September 5, 2017. Dr. Adams, a board-certified anesthesiologist, served as state health commissioner of Indiana from 2014 to 2017. Dr. Adams, a Maryland native, has bachelor’s degrees in both biochemistry and psychology from the University of Maryland, Baltimore County, a master of public health degree from the University of California at Berkeley and a medical degree from Indiana University School of Medicine. Dr. Adams was also an associate professor of clinical anesthesia at Indiana University School of Medicine and a staff anesthesiologist at Eskenazi Health, where he was chair of the Pharmacy and Therapeutics Committee. He has served in leadership positions at a number of professional organizations including the American Medical Association, the Indiana State Medical Association and the Indiana Society of Anesthesiologists. He is the immediate past chair of the Professional Diversity Committee for the American Society of Anesthesiologists. As health commissioner, Dr. Adams presided over Indiana’s efforts to deal with the state’s unprecedented HIV outbreak. In this capacity, he worked directly with the Centers for Disease Control and Prevention, as well as with state and local health officials and community leaders, and brought the widest range of resources, policies and care available to stem the epidemic affecting that community. He also helped with the successful launch of Indiana’s state-based, consumer-driven alternative to Medicaid expansion and worked with the state legislature to secure more than $10 million to combat infant mortality in high-risk areas of the state. As surgeon general, Dr. Adams’ motto is “better health through better partnerships.” Dr. Adams is committed to maintaining strong relationships with the public health community and forging new partnerships with non-traditional partners, including business and law enforcement. He has pledged to lead with science, facilitate locally led solutions to the nation’s most difficult health problems and deliver higher quality health care at lower cost through patient and community engagement and better prevention.